Last weekend I made the most of an odd day of autumn sunshine and brought out a Topshop skirt that I bought ages ago and hadn't really worn. 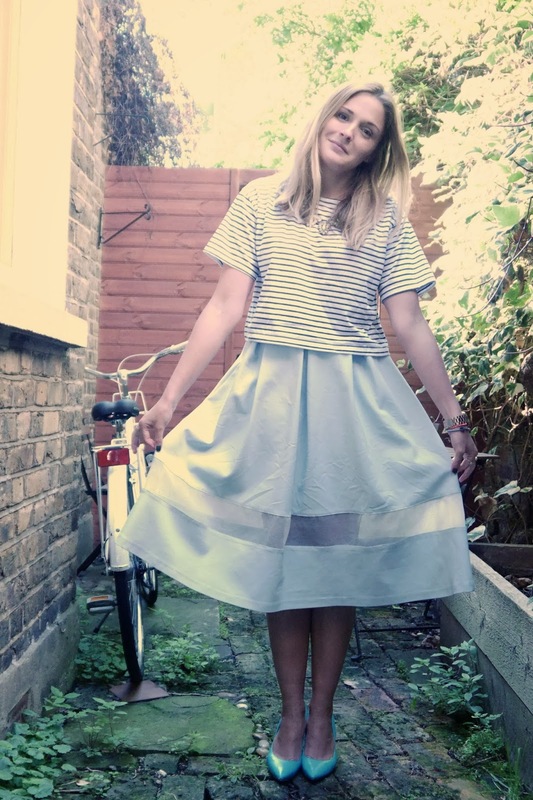 It was the skirt of the summer in my opinion, firstly coming in white and then follow up colours in blue, pink and a printed pastel as worn recently by my friend Briony here. I went with the blue after much deliberation, and thank god I did as it sold out everywhere in days after I bought it. The tee is Topshop too (here and similar with red here) and is one of my favourites. I bought it a size smaller so it would sit a little better with my high waisted things, and I ended up wearing it constantly over the summer whilst on holiday with shorts or just bikini bottoms (I was on the beach, not just roaming around in my pants...). I wore this to pop along and taste some cocktails at the recently refurbished Met Bar inside the Metropolitan Hotel on Park Lane. They ran a special promotion during London Fashion Week and made the most amazing cocktails themed around designers like Burberry, Paul Smith and Vivienne Westwood. If you are in town and fancy popping in somewhere for a quick treat, I wholeheartedly recommend this place. Hugo and his team behind the bar were amazing. I'm still pretty determined to keep the midi skirt thing going in winter; pair them with ankle boots (like these) and simple wool knits (like these) and tights, unfortunately. I'm going to South Africa for the best part of 3 weeks in December too so am looking forward to some summer sun. It's nice to know that my shorts and tees will getting an airing before the next UK summer, whenever that might be! 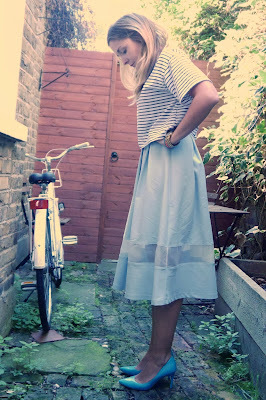 I knew from the mere title of your tweet which skirt you would be referring to, and oh what a beauty it is! I just loved this powdery blue version too (I wanted all three, but settled on the printed satin version in the end), and it looks SO gorgeous on you with your tan and blonde hair. I'm going to wear mine for a few more weeks with a tight long-sleeved black ballet top and heels, but after that I think I'll pack it away for the season (before bringing it out with joy again next spring).